Kingdoms CCG Dev Blog: Update is Live! For a full run down of the improvements in today's release, please read last week's blog post. The Bard Bundle has been replaced with a new bundle that includes PvP season 1's Summoner's Gambit card instead of the Bard. It's an amazing value with 150 Gems and the card for just $10! If you've already purchased the Bard Bundle you WILL be able to purchase this bundle as well. And if you hadn't, don't worry we'll switch between the two bundles every so often so that players can get both if they so desire. And yes, if you do purchase the new bundle, you will unlock Summoner's Gambit in the Prize card section of the shop so that you can get copies 2-4. 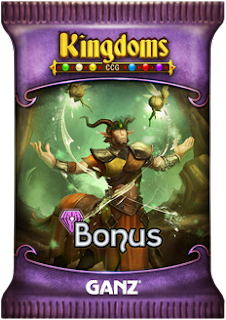 Now when you spend $20 or more on a single Kingdoms purchase, you will receive Bonus packs in addition to everything else you purchased. Each Bonus pack contains three cards, two of which are guaranteed to be rare or better. It is even possible to get a Rare, Epic and Legendary in a single Bonus pack. Recently we had the unfortunate situation where a user repeatedly spammed chat with the use of alt accounts, creating a very negative user experience. To prevent this from happening in the future, all new accounts will be required to get 10 wins before they can join the chat. We hope that this will create a serious enough speed bump for those who wish to abuse chat with multiple accounts and help our moderators maintain an enjoyable chat space. We hope that you enjoy these new changes to Kingdoms CCG and we'll see you on the battlefield!